If you have any questions regarding our services, please contact us and we'll get back to you as soon as possible. We look forward to hearing from you. 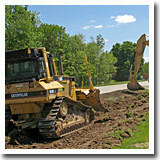 Howell Paving, Inc. is a heavy and highway contractor operating primarily in central Illinois and southern Illinois. We specialize in asphalt and concrete paving, bridge rehabilitation, and site preparation.